Another version of Mac OS X? Yes, just seven months after Mac OS X Lion (s AAPL) was introduced, Apple is releasing its first developer preview of what comes next for its big cat-themed desktop operating system, to be called “Mountain Lion.” And just like Lion before it, Apple’s desktop OS is starting to bear more than a passing resemblance to iOS, especially with the new incorporation into the software of iOS features like iMessage, Game Center, Reminders and Notifications. 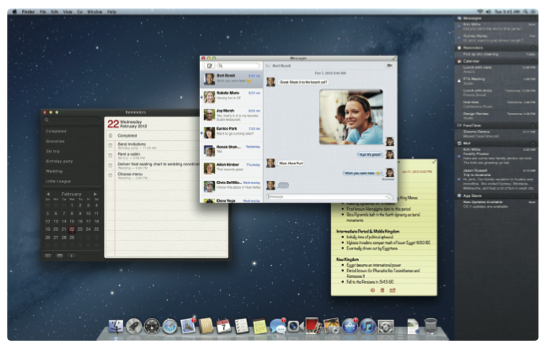 Mac developers will get the first chance to sink their teeth into the developer preview of Mountain Lion starting Thursday. The rest of us will be able to download the finished product sometime “this summer,” according to Apple. Mountain Lion will be a paid download from the Mac App Store, like Lion, but Apple says it’s not yet ready to talk about price. Looking at the company’s balance sheet, it’s obvious that Apple is defined by mobile. This next OS X release drives that point home even more, and shows that CEO Tim Cook meant what he said about iCloud being a company strategy for the next decade. Though Apple sold more Macs last quarter than ever before (5.2 million), that’s still not satisfactory for the company: with Mountain Lion taking on so many familiar traits of iOS, Apple clearly intends to make it more difficult for iPhone and iPad lovers who are Mac OS holdouts to continue to say no. Built-in iCloud integration. Setting up iCloud will be the second thing you do after setting up a new Mac with Mountain Lion. The big new thing in this version will be the ease with which you can access Documents in the Cloud, which will allow your documents created in Pages (or some other third-party apps) to be available on any Mac OS or iOS device. iMessage on Mac. Many people have been asking for this, and finally we’re going to get it. 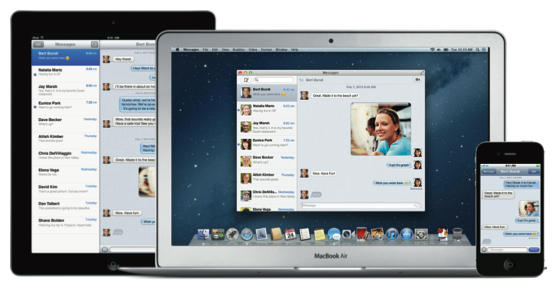 The Messages app, which will appear very familiar to iOS users, replaces iChat. It’ll let you start a conversation on a Mac and continue it on a different device, like your iPhone or iPad. Notes and Reminders. Any notes you make on a Mac or iOS device, along with any reminders you set for yourself, will show up on any of your Mac or iOS devices. Both apps can be searched and look easier to navigate with the additional screen space of a desktop. Notes can be “pinned” to your desktop. Notifications. Just like the drop-down Notification Center on iOS, the Mac is getting its own version in the top right corner of the screen. All reminders, app alerts and calendar appointments will appear there. And just like iOS, Mountain Lion Notification Center has its own swipe to bring up the window — two fingers right to left from the right edge of the trackpad. Sharing from apps. That sharing arrow that appears in iOS apps? Apple has inserted it in many Mac applications and dubbed it Share Sheet. That button will let you share web pages, notes, videos, QuickTime files, docs and photos via email, Messages, AirDrop or Twitter, or post photos or video to Vimeo or Flickr (s YHOO). Twitter integration in the OS. This is kind of a big deal for Twitter. When you share something via Twitter in Mountain Lion, a Tweet Sheet pops up, which looks like an index card with whatever it is you’re tweeting attached via paper clip. GameCenter. Apple’s social gaming network comes to the desktop, and brings with it a new opportunity for developers. With a new set of GameKit APIs, game creators can develop games for both Mac and iOS, so players can compete whether they’re on an Apple desktop or mobile device. Current Game Center-compatible iOS games will have to be converted to appear in the Mac App Store. AirPlay Mirroring to Apple TV. Just like an iPad or iPhone 4S, you will be able to mirror your Mac desktop on your TV via an Apple TV (as long as your Mac has an Intel Core i3, i5 or i7 processor). New security features. Gatekeeper lets users select settings to control which apps can be downloaded to a computer. You can choose to allow all apps, or only apps with a developer-signed ID program (run by Apple) to be downloaded. Or, for the most conservative choice, only apps from the Mac App Store. Improved features for Chinese users. Apple is making a special point to improve text input and make popular Chinese web services and apps a built-in choice for some applications for customers in its second-most important market. The next version of Mac OS very much treats the Mac as an equal to the iPhone and iPad. With iCloud at the center of it all, it doesn’t matter where you start a game or save a document or save a note — the Mac is no longer the thing to which your mobile devices plug in. Apple has 100 million registered iCloud users now, and by making it easier to access it or sign up from new Macs with Mountain Lion, it’s sure to add to those numbers in short order. But even in this mobile, post-PC world, Apple is showing it has no intention of letting the Mac just slink along. Its computers have always been outsold by its mobile devices: first the iPod, then the iPhone and the iPad. Rather than accept the idea that its mobile devices are more popular and focus all its energy there, Apple is making a move with the Mac. Another effect of what Apple is able to do with these evolutions in its desktop OS is it’s bringing current and potential users further and further into its grip. That’s not meant to sound sinister — though to some people it may well be — it’s just that Apple is pressing even harder to make a customer’s decision to use competitors’ products that much more difficult. Whether it’s making Mac OS feel familiar to happy iPhone and iPad customers so they won’t think of using another PC brand, or enabling people to set their computers so that only Apple-approved software is downloaded, all the work Apple has done for the last 15 years is paying off: Each of its products is set up to provide a halo effect on the others. That’s a really hard thing for any one manufacturer to do. But it’s because of Apple’s extreme focus that their products line up together so cohesively and logically. Not everyone is going to buy into it, but Apple makes doing so seem very easy. new version OS.its better on a clear & clean simple desktop. remove those icon on screen display. dock station is enough. Random question: Are they going to get rid of widgets? Not that I have strong feelings on the matter either way, but I looked at my dashboard for the first time in what felt like years. Looks like most of the widgets I downloaded way back when are no longer supported. I’ll be honest, I’m a little surprised that it made the cut for OS X Lion. Will we see apps that are similar to the ones on the iOS take the place of widgets? Sadly people don’t know what they are missing. I used PC’s for the first 20 years of my life exclusively. Running DOS (only), Windows, Windows 3.1, Windows 3.11, 95, 98, XP, Vista, and now 7. But I also use Mac. I prefer the Mac but my employer like so many others have an IT department that can’t see the benefits to them from Apple. Im in the same situation as Matt… What gives apple the edge for me is their tight integration… Microsoft has 20+ years of poorly designed API’s and lack of integration and Apple has finally built a better mouse trap. I think its interesting that Maria refers to Apple’s tight integration as a gimmick. This “gimmick” is what differentiates Apple from their competition. I think in this context one could replace the word “gimmick” with “true innovation”. What has Microsoft invented lately but yet another bulky, bloated non user friendly OS that is barely integrated with itself? Apple could not compete in the PC world, as Microsoft ate Apple’s lunch since 1995. Hopefully with this mobile OS they will have more success, unless Android eats their lunch! Good Luck Apple, only a handful of people should fall for this gimmick! Like how only a handful of people will fall for the Google services gimmick? Just how much could they charge before a flood of complaints hit the inter webs? $5 or $10? “Mountain Lion” will be available to public this summer. Is this the preparation for next iphone 5 (http://harryminhas.wordpress.com/2011/02/09/iphone-5/)? iMessage, twitter integration & iCloud will boost apple’s image in social communication and will also increase sale of Apple macs. No doubt Apple will bring these features to their new iTV product.